I got a 60 watt on sale at Radio Shack. I like mine. Like you said, plenty of heat. I have never heard of or used a Hobbico brand soldering iron. I almost bought a Radio Shack brand off of eBay but it was 20.00 and the seller wouldn't go any lower. I came across the Hobbico brand and searched it and found another model had good reviews on Amazon, so I bought the one for 10.00. Usually I would only use 30 watt irons since that's what we had in school but I figured it was time to go a bit larger since i'm working on radios now and not only wires and PCB's. If you should need a different tip shape, you might go on Ebay and find some with the same size as the receptacle in the iron. If it fits, it should work. I think a chisel tip will be fine for most of the stuff I will be doing.. I can always put a tip in my 25 watt Weller iron if I need a pencil tip, as it would be easier to replace. OK..... I'm sure y'all will think I'm nuts after this but I have way too much soldering equipment! Back in 1967, and still in high school, I worked at a hardware store where I purchased my 1st Weller 8200n. I still have it along with 6 more Weller 8200's, all vintage (using the nuts and wrench). I also bought a lot of Weller items that included 2 Weller 7200's. I also have several of the older Weller irons, several 23W, a few 40w, and a 12w. I have 2 of the 25w with 3 LED's. Next I have 2 60w units that are powered by a wall-wart. I also have several Ungar handles, elements and tips all having various wattages ranging from 23 to 45 watts. When Comdial closed I purchased ( for $5 each) 2 Hakko variable soldering stations. I also have several irons used by the Bell System years ago. I won't even start on all the solder and soldering aids! They're not too many if you use them all. MEZLAW wrote: OK..... I'm sure y'all will think I'm nuts after this but I have way too much soldering equipment! Back in 1967, and still in high school, I worked at a hardware store where I purchased my 1st Weller 8200n. I still have it along with 6 more Weller 8200's, all vintage (using the nuts and wrench). I also bought a lot of Weller items that included 2 Weller 7200's. I also have several of the older Weller irons, several 23W, a few 40w, and a 12w. Well I may be wrong about the year of purchase, I worked there from 67 to 70. I went out to the shop to check the gun and it's an 8200N. So it has to be as early as 70. I graduated from CSE in August of '70 and had the gun there, so I guess we're splitting hairs here. This unit also has the Easton PA address where some of my newer ones have APEX N. Carolina. I have one in the same grey case and the factory cellophane is still on it, so I've never opened it. I also have another in the original cardboard box. This unit has the spring around the power cord where it comes out of the handle. That wedge base bulb in the 8200N is a 12 volt number 194 automotive type bulb for use in instrument clusters and side marker lamps. Doug Burskey wrote: That wedge base bulb in the 8200N is a 12 volt number 194 automotive type bulb for use in instrument clusters and side marker lamps. I've noticed the brightness change (with penlight bulb) on an older gun when you went from 100 watts to 140 watts. The thing I have that uses a #159 is a Audiotronics school record player as a pilot lamp. 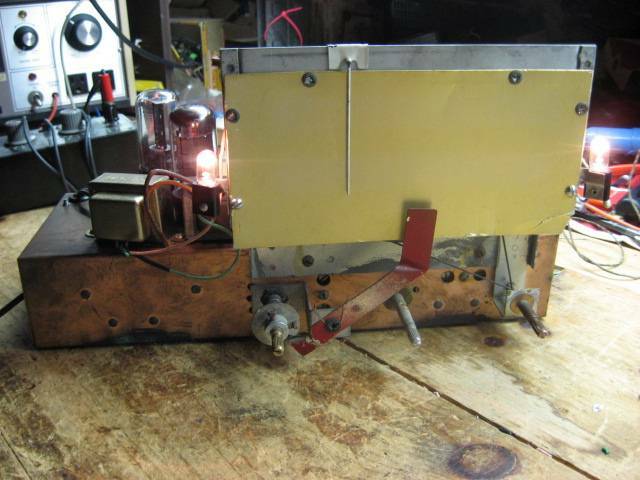 Doug Burskey wrote: The thing I have that uses a #159 is a Audiotronics school record player as a pilot lamp.